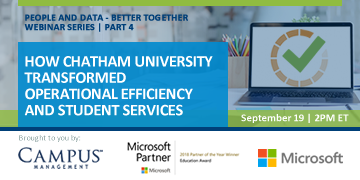 How did Chatham University in Pittsburgh, Pa., transform operational efficiency and improve student services? How was the institution able to devote more time to better serving students and working on strategic initiatives that help them succeed? Join Jenna Godfrey, Manager, Administrative Systems and Lindsay Reznik, Manager, Administrative Systems from Chatham University to learn how the institution leverages new technology to devote more time to better serving students and working on strategic initiatives that help them succeed. Jenna Godfrey is the Manager of Administrative Computing in the Information Technology Department at Chatham University in Pittsburgh, Pennsylvania. She has worked in Higher Education for 14 years. Jenna joined Chatham University in 2005, and has worked in the IT department since 2010. In her current position, she works supporting and managing the administrative computing systems used on campus. Prior to that, she worked as an Admissions Representative for the online programs, and held the position of Assistant Registrar. Lindsay is the Campaign Administrator in Administrative Computing with the Information Technology Department at Chatham University in Pittsburgh, Pennsylvania. In her current position, she works with marketing on creating the campaigns in Admissions for programs and events. She also assists in supporting the administrative computing systems used on campus. Lindsay has two years of experience working with Campus Management products. She is well versed in all aspects of the products, and has established campus policies and procedures for working within the system.